Check out these unique valentine card box ideas for your child’s classroom! It seems that every year more parents are getting creative when it comes to the holidays. Valentine’s Day is no exception! Here are 29 Adorable DIY Valentine’s Day Box Ideas that will give you some inspiration to craft your own. Because we all know your child needs a totally awesome valentine card box to store their cards and goodies from all of their friends! If you love getting your kids together for some fun arts and crafts projects, then you will have so much fun making a homemade valentine box. There are so many fun ideas that will make your card box quite the masterpiece. If you don’t know what to make, think of your child’s favorite characters or hobbies and come up with an idea that shows off their personality. Some of our favorite card holders include a unicorn, emoji, puppy dog, and Darth Vader. Many of these unique valentine box ideas are made from leftover cardboard boxes or shoes boxes and a small list of craft supplies. So grab your glue gun and great ready for some DIY Valentine’s Day fun with the kids. Your children will love showing off their handmade valentine card box off to their friends at school! 1. 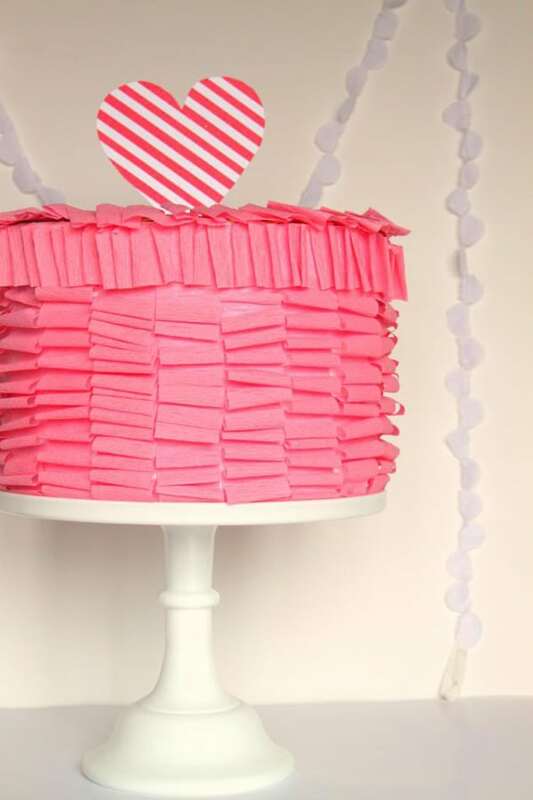 This sweet Pink Ruffle Cake Valentine Box is the perfect place to keep your special valentines! This valentine box idea is easy enough for the kids to make. For this project, pick up a round craft box from your local craft store. Then gather the rest of your supplies like a glue stick or hot glue gun, crepe paper, regular white paper, and scissors. Decorate your valentine cake box however you like by adding your own special decorations. 2. 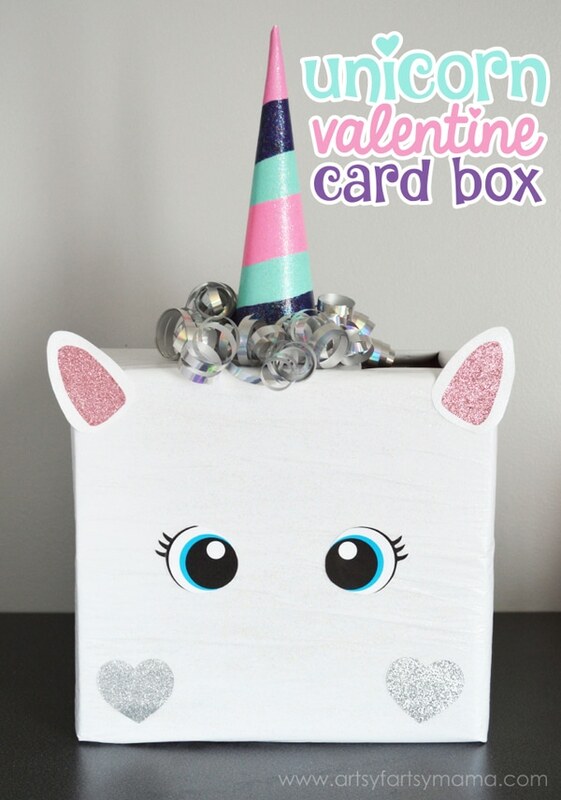 What little girl wouldn’t LOVE this awesome Unicorn Valentine Box?! What a fun valentine card box to show off at school or at a fun Valentine’s Day party! After you find a cardboard box, gather your supplies to make this project. You will need tissue paper, ribbon, Mod Podge, paint, cardstock paper, tape, glitter paper, etc. Then get ready to make a magical unicorn card box for school! Put your own spin on your unicorn box and get as creative as you want. 3. Is your child a huge Star Wars fan? 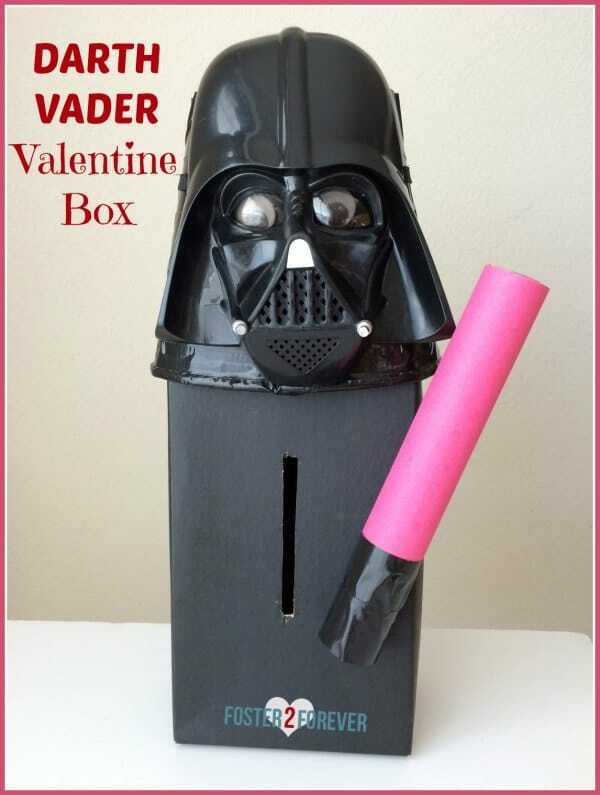 If so, this Darth Vader Valentine Box is perfect for their cards and candy! The kids will go wild when they see this at school or at your Valentine’s Day party! We love how you can transform a simple cardboard box into your favorite movie characters! For this project, you need an empty tissue box, scissors, black paint, Darth Vader mask, black tape, pool noodle, and hot glue gun. This Star Wars inspired card box is super easy to make and you and your child will have so much fun making it together. 4. 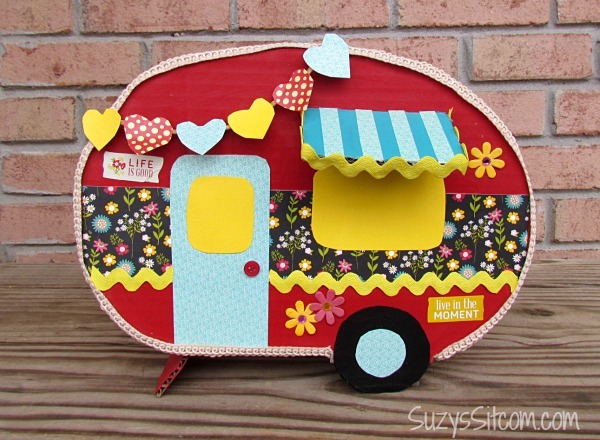 This Happy Camper Valentine Box is so creative! 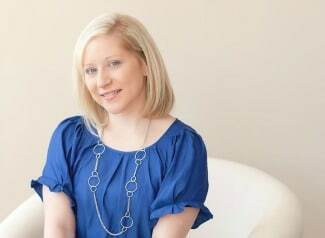 This project maybe for your more experienced crafter, but don’t let that discourage you! Put your own spin on this happy camper box. I’m envisioning a pink vintage camper! This camper card box is made with all scraps and recycled material. To begin, you will need a cardboard box, paint, scissors, Mod Podge, hot glue gun, glue, variety of scrapbook paper with cool designs, fabric trim, buttons, ribbon, etc. With a little creativity you can make it your own and show off your personality. Add flowers, jewels, etc. for a handmade camper you will love to show off to your friends. 5. 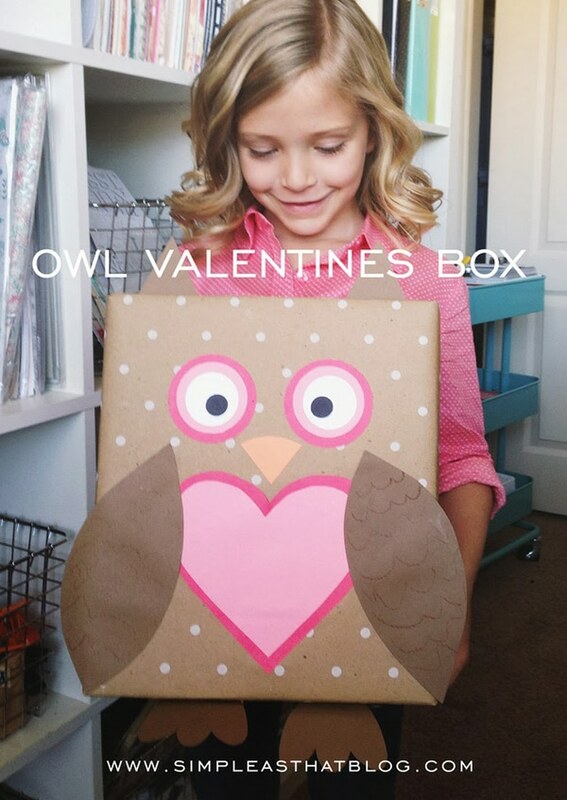 Grab an old cardboard box and make this adorable Owl Valentine Card Box with the kids! This project is easy to make and can easily be turned into a boy’s owl box with some blue and green details. Grab a leftover box, wrapping paper, tape, cardstock, scissors, construction paper, and glue and start crafting your owl box. What a pretty awesome valentine card keeper! 6. 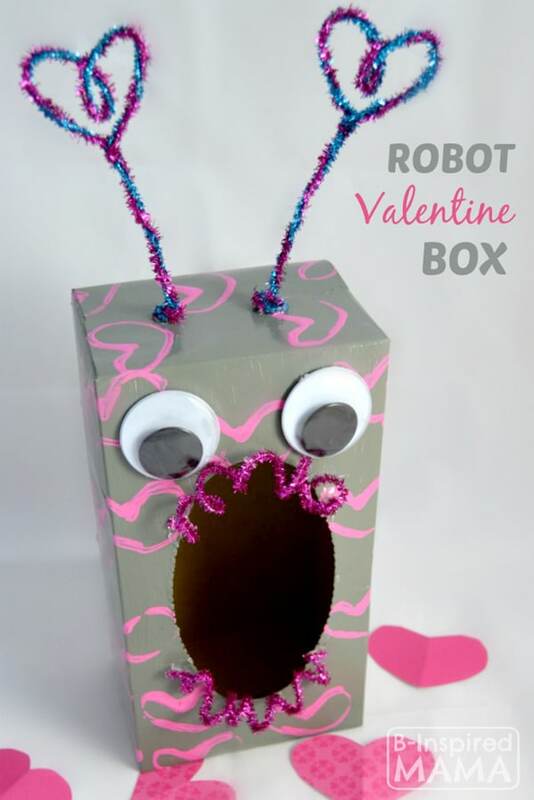 A tissue box and a few craft supplies are all you need to create your very own Robot Valentine Box! 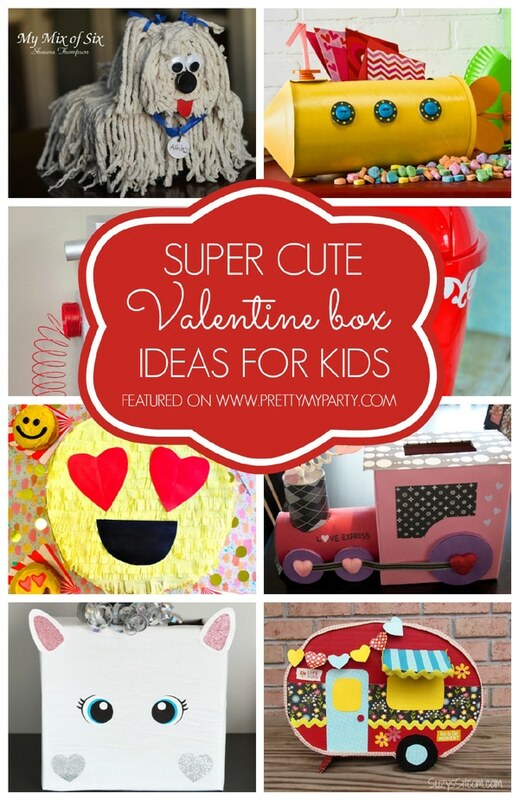 The kids will have so much fun creating this unique box to hold all of their valentines! 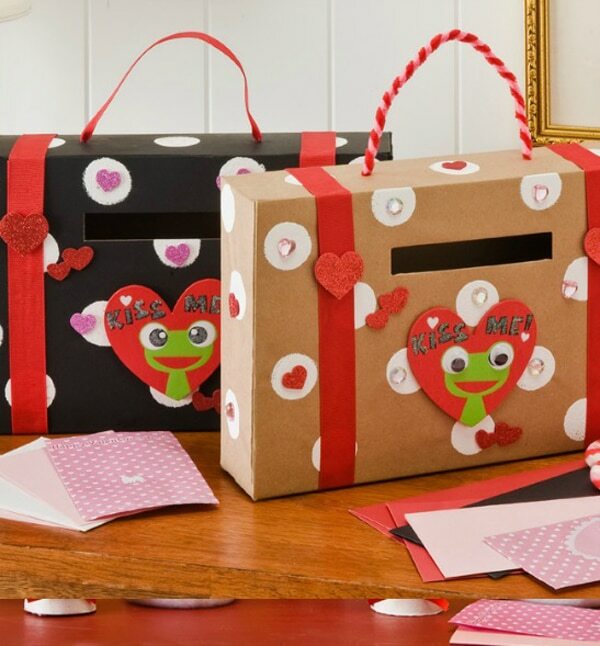 Add two large google eyes, some paint and paper hearts and you have one adorable card box for school. Just a few supplies are all you need to put this quick and easy project together for Valentine’s Day! 7. 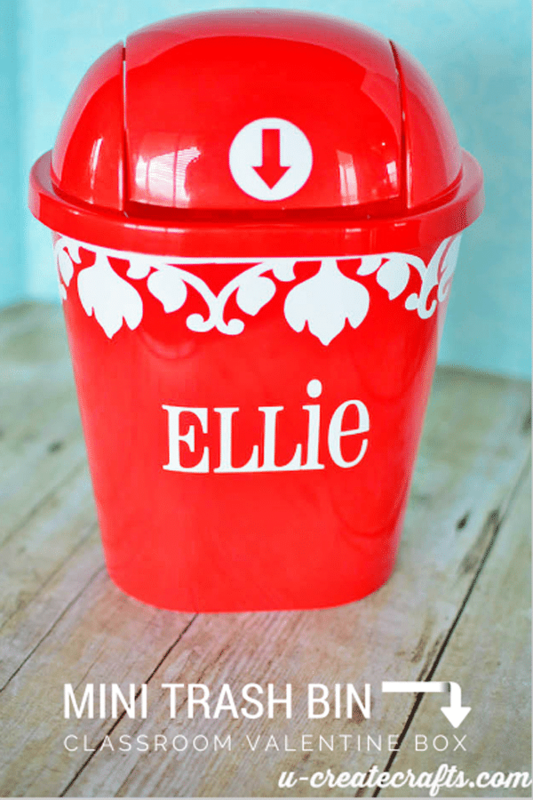 This Mini Trash Bin Valentine Box doesn’t require any leftover cardboard boxes but it’s super easy to make. You can find a mini trash bin at the dollar store. All you have to do is add some vinyl to make it your own. Add your name, some hearts or other designs for your one-of-a-kind card holder. 8. 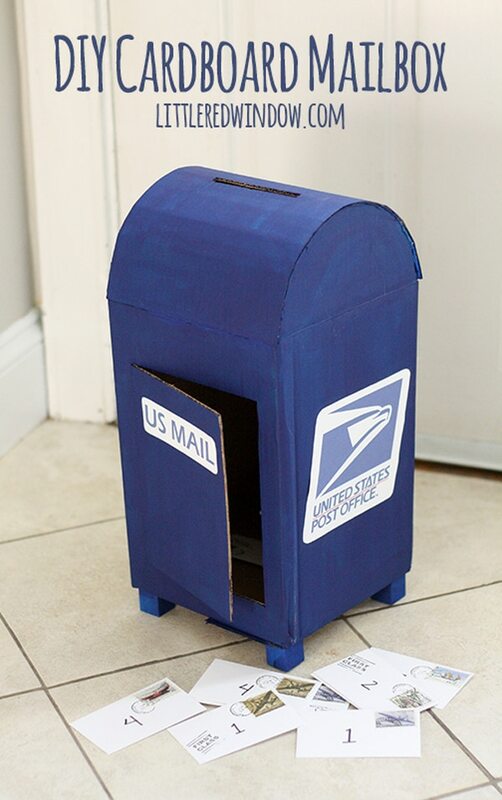 The United States Postal Service would agree that this DIY Cardboard Mailbox is perfect for your valentine cards and gifts. This one requires a parent’s help. To begin, grab an old cardboard box, exacto knife, small wooden squares, acrylic paint, paper and glue to get started on your mailbox. Once your done, you have one pretty cool valentine card box. 9. 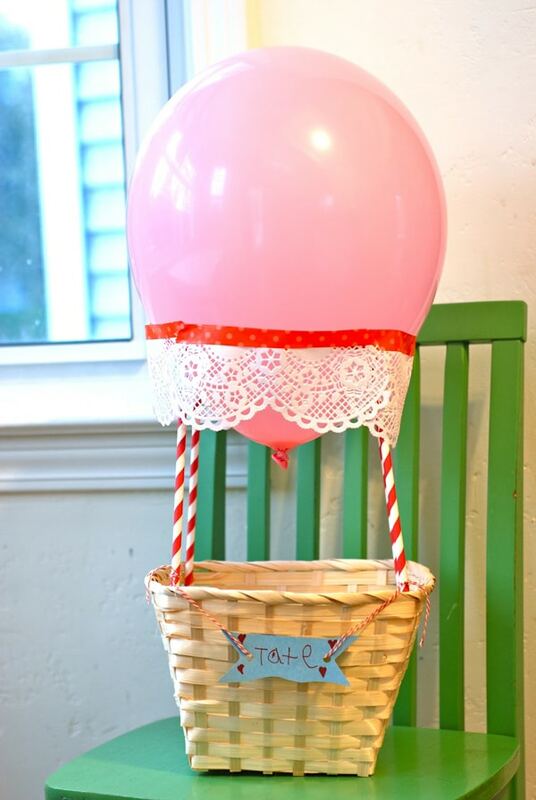 Another fun, creative box idea is this Hot Air Balloon Valentine Box! Grab a basket, some paper straws, a balloon, doilies, and washi tape and craft this before Valentine’s Day to fill with candy, gifts, etc.! Since this is not your traditional card “box” idea, everyone will love this creative valentine project. 10. Take this fun DIY Valentine’s Day Emoji Gift Box idea and make whatever emoji fits your personality! We personally think this one is perfect for Valentine’s Day with its heart eyes! 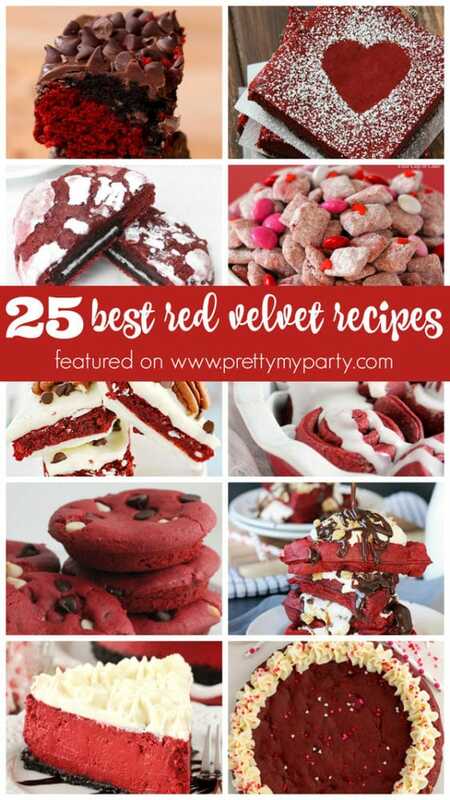 This would also make a great Valentine’s Day party theme don’t you think?! This is a party piñata but can easily be converted into a valentine box for your child’s classroom Valentine’s Day party. 11. 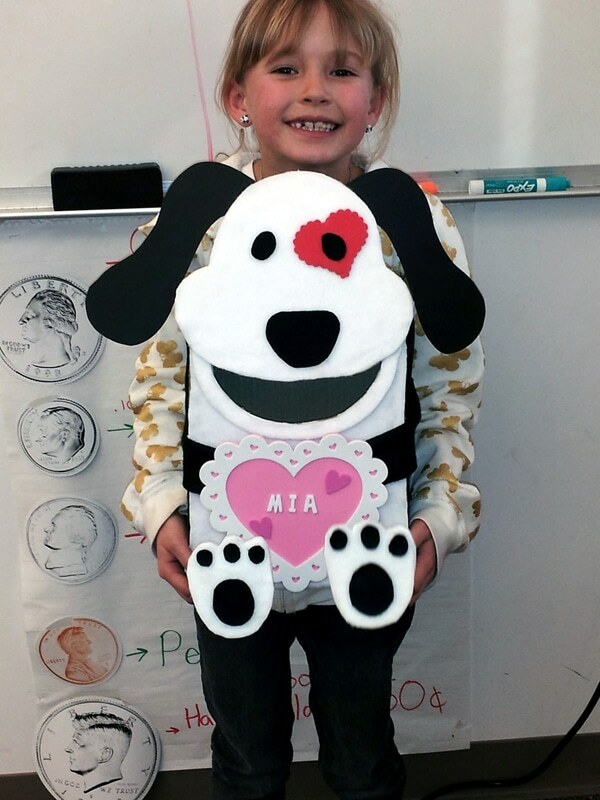 Craft a sweet Puppy Dog Valentine Card Box like this one for Valentine’s Day! 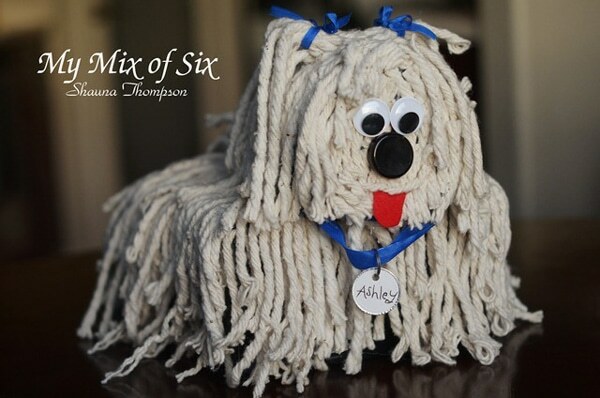 Or make one that looks like your favorite furry friend! For this craft, you need a box, felt in a variety of colors, scissors, and glue. You can make a puppy dog or kitten for an adorable card box everyone will love at school. 12. We love the variety of animal card boxes here and this Froggy Valentine Box is no exception! 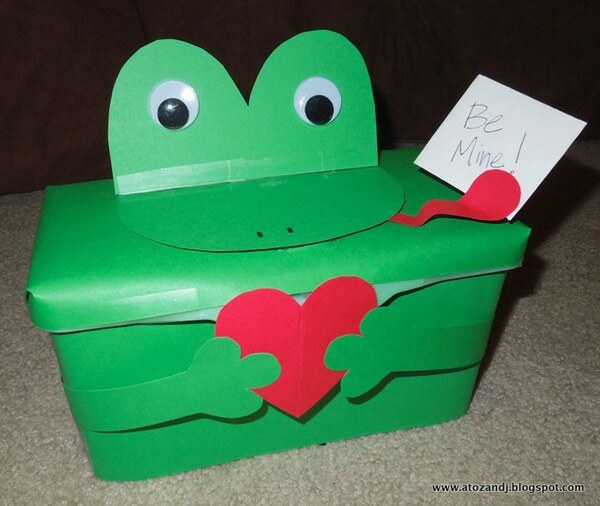 Can you believe a leftover Huggies wipes container was made into the sweetest valentine frog card box?! It’s just too adorable. It only takes a few supplies to make this easy project. 13. 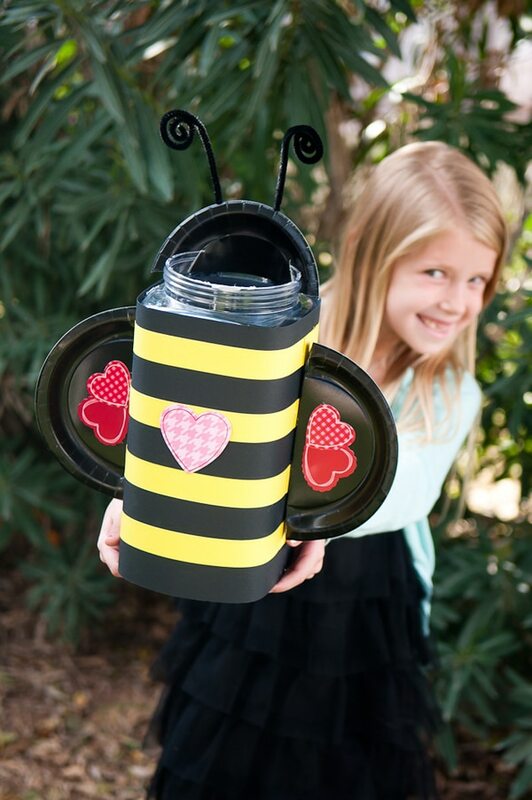 A pretzel tub was turned into this fun Bumble Bee Valentine Box! How creative! You can also make a butterfly, ladybug or bird with this type of canister. Add some paper, stickers, and even some black paper plates and you’ve got yourself a pretty awesome craft to show off to your friends. 14. 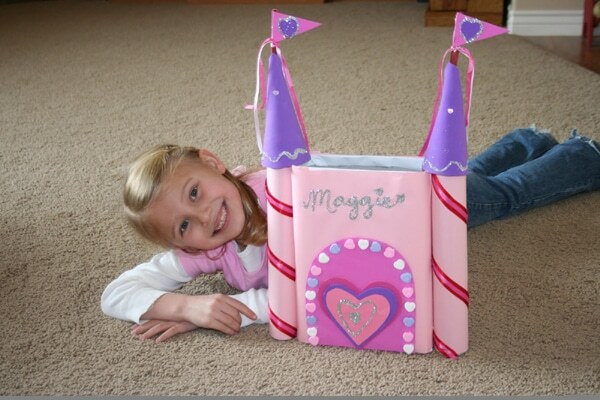 If your daughter loves all things princess, then this Princess Castle Valentine Box is the perfect craft project for you! Make this magical castle with some glitter, glue, conversation hearts, a leftover cereal box, foam paper, ribbon, etc. Any little girl will have a blast making this craft! 15. All aboard the love train express! 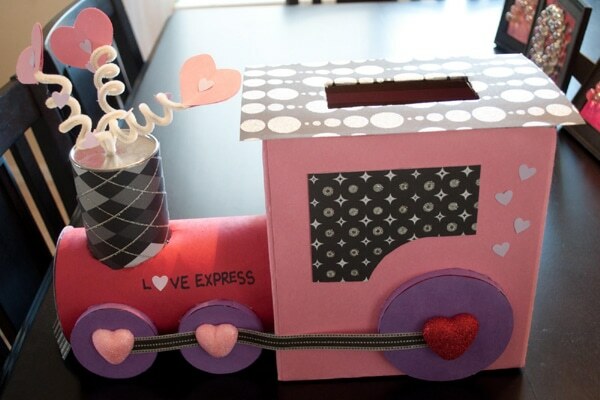 How cute and creative is this Love Express Valentine Train Box?! This projet can easily be turned into a boy’s valentine gift box! We all know little boys love trains! With a few craft supplies like construction paper, glue, hearts, and scrapbook paper you can have your very own train card box just in time for Valentine’s Day. 16. 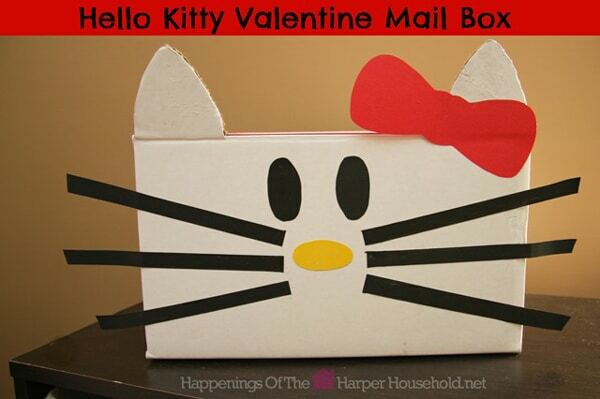 Make this super easy Hello Kitty Valentine Box with just a box, construction paper, scissors, and glue! It’s so easy to make this gift box with your little Hello Kitty fan. Don’t forget to add a cute red bow! 17. 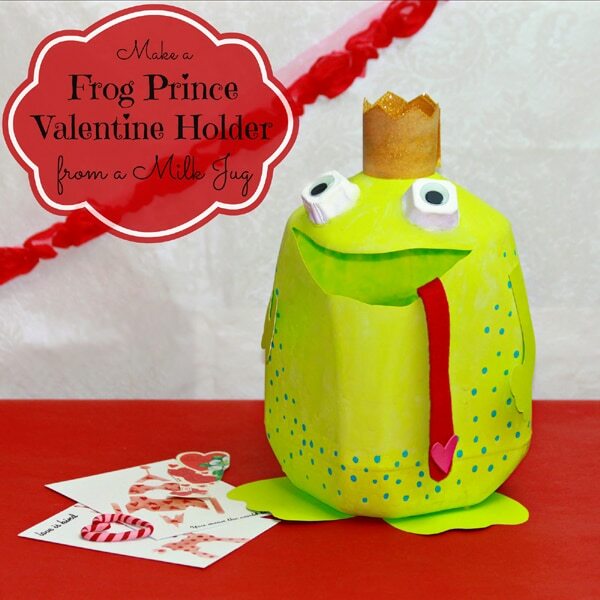 Grab a milk jug and create this awesome Frog Prince Valentine Card Holder! Get out the paint, glitter, cardstock paper, scissors, glue gun, egg carton, Mod Podge and felt and turn your everyday ordinary milk jug into a fabulous frog. This is just so perfect for Valentine’s Day cards. Don’t you think? 18. 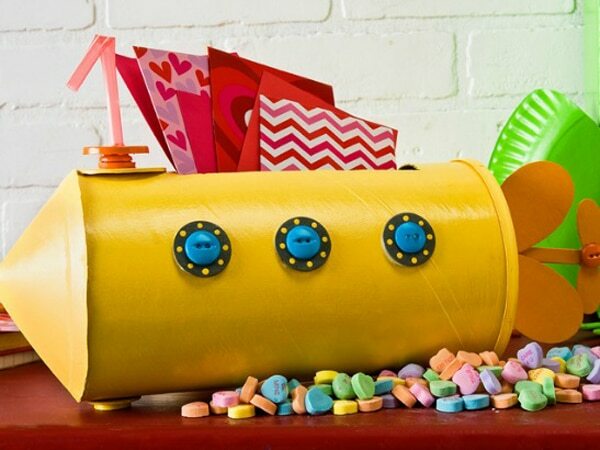 How cool would it be to show up at school with this awesome Yellow Submarine Valentine Card Holder?! This box is so different and unique. The teacher will definitely give you an A+ for creativity! 19. Look like a business professional with this great DIY Cardboard Suitcase Valentine Card Box Holder! With a few simple craft supplies, you can dress up your suit case for school and your Valentine’s Day party. Hearts, jewels, and a cute frog make this adorable box party-worthy. 20. 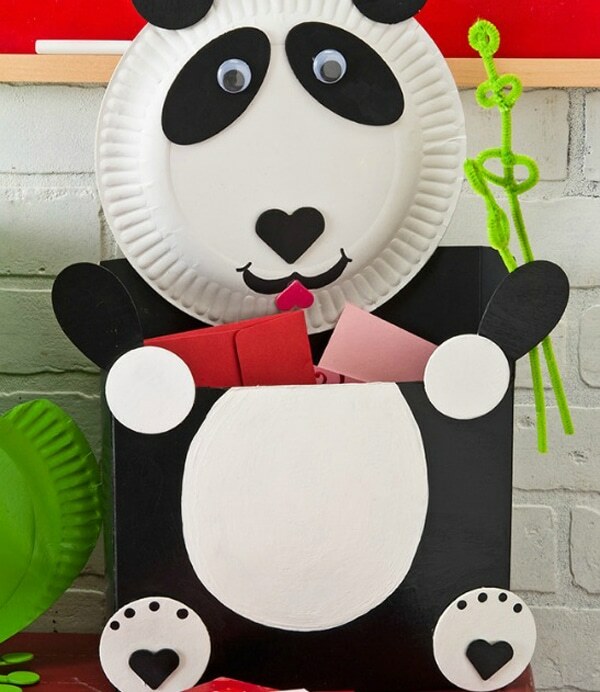 We love this sweet Panda Bear Valentine Card Holder. This just shows you that any animal can be made from a cardboard box. What a great idea for a card and gift holder. 21. 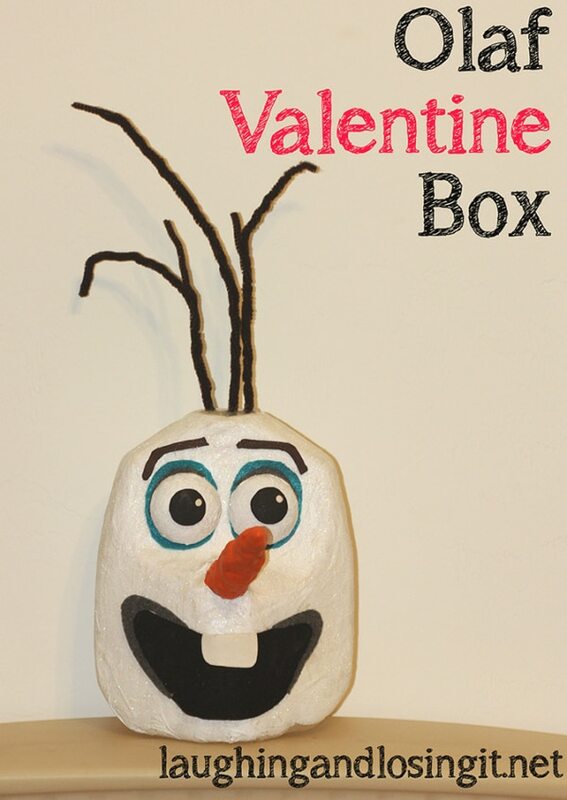 Everyone loves the movie Frozen and if you have a Frozen fan in your house, get ready to make this awesome Frozen Olaf Valentine Card Box for school! Everyone in your child’s class will be impressed with this Disney-inspired creation! 22. 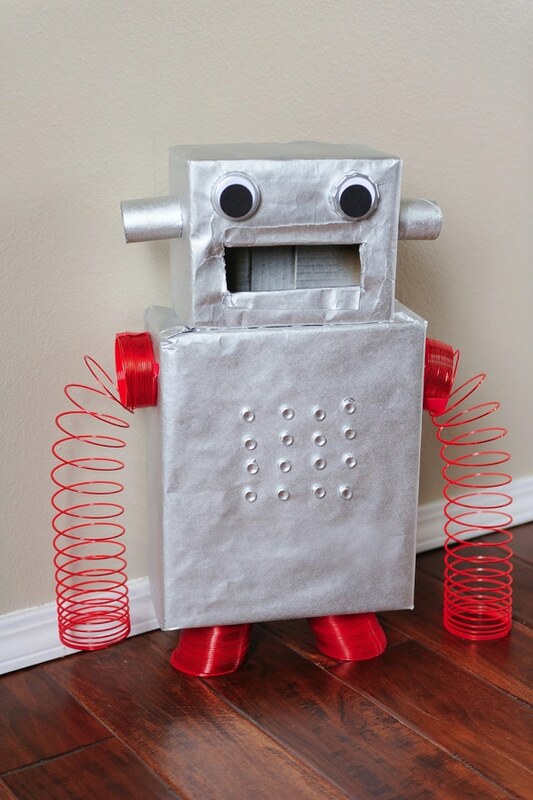 Make this adorable DIY Robot Valentine Box complete with Slinkies!!! If there were a valentine card box contest at school this one would definitely be a winner! It’s easy enough to make with the kids and will be a real showstopper at their valentine party. 23. 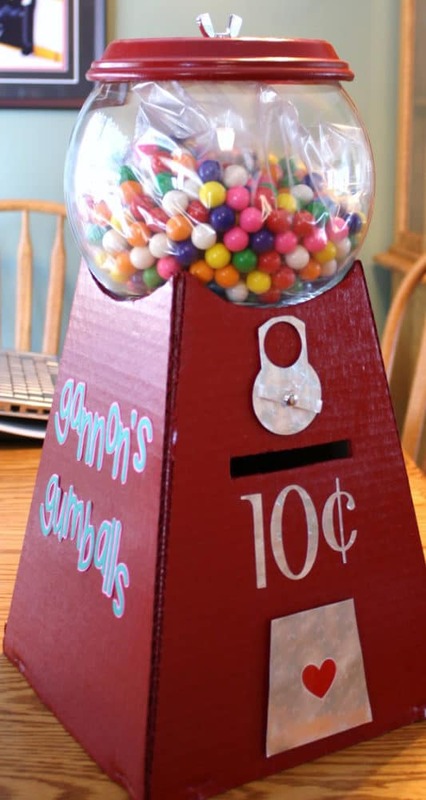 Another awesome creation is this Gumball Machine Valentine Card Holder. Seriously, how cool is this?! This one would definitely be a classroom favorite for sure! 24. 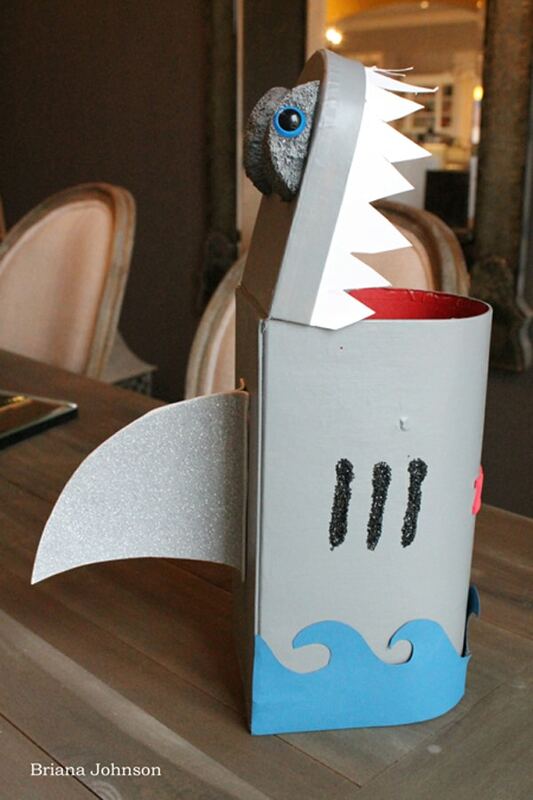 All the kids in class will think this DIY Shark Valentine Box is JAW-some!!! If you’ve even been to the Dollar Store you will find cute cardboard mailboxes. Pick up one of those and some other supplies to make this fun creature for your valentine cards. 25. 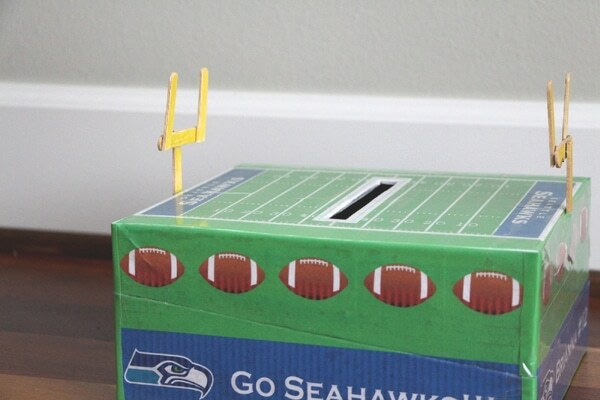 If you have a die-hard football fan at home, make this creative Football Stadium Valentine Box. All you need is an old shoe box, some popsicle sticks, glue, paint and your team’s logo. Get a free printable football field to add to the top of your box to complete your football stadium. 26. Get out a mop and box and make this sweet DIY Puppy Valentine Box. Customize the dog collar with your chid’s name for a personalized touch. Head to your local craft store and grab some eyes, red felt, and blue ribbon. A bottle cap is perfect for the puppy nose. GENIUS! 27. 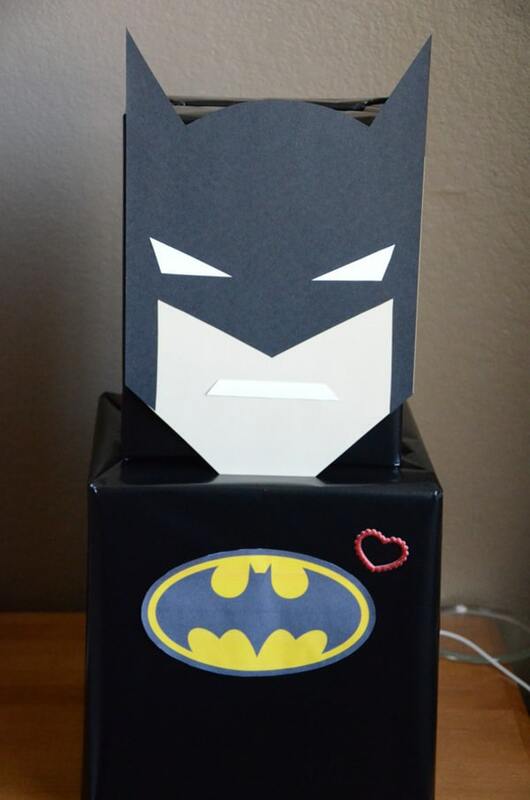 If superheroes are your thing, this Batman Valentine Box is perfect for all those sweet treats and notes from friends. 28. 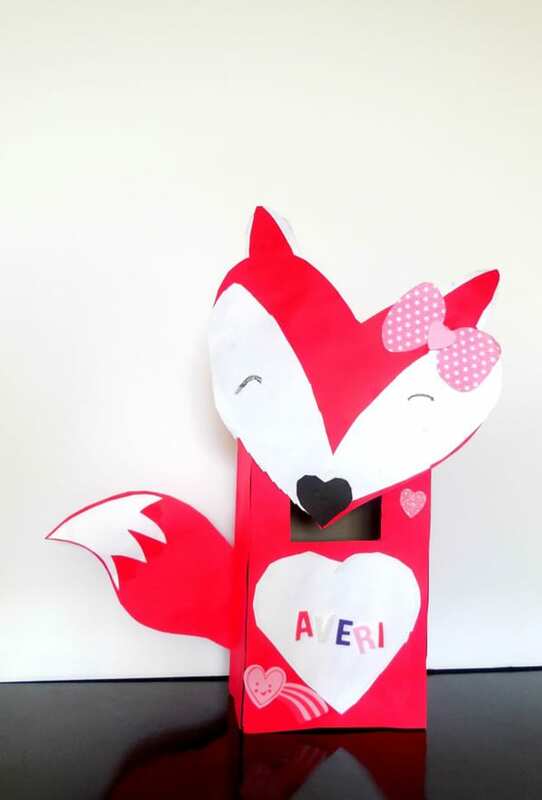 A tissue box was made into this cute Fox Valentine Box. Some construction paper and stickers, glue and scissors are all you need to make this fun craft idea. Add your child names on the front in coordinating colors. 29. 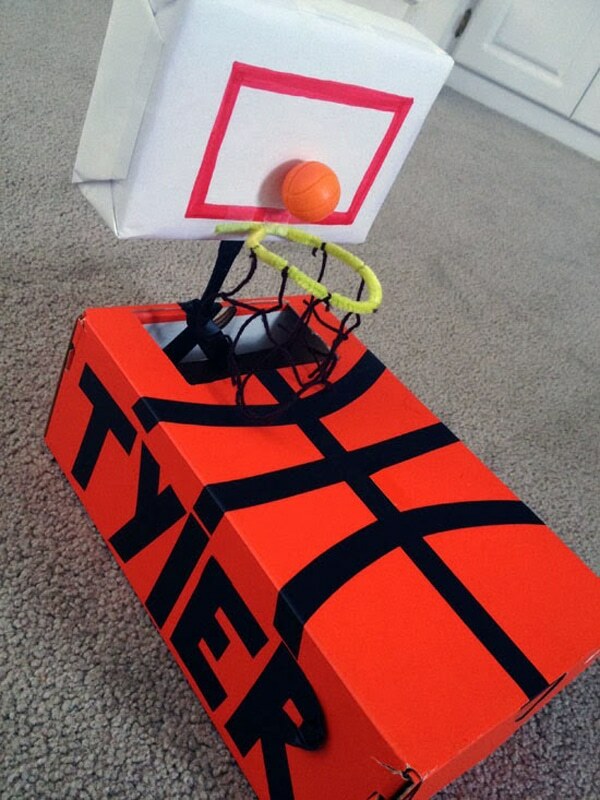 This creative and unique shoebox Basketball Valentine Box is super cool for your little athlete. All of your child’s friends will be talking about this gift box. Add a little ball and the kids also have a fun party activity. Which of these 29 Adorable DIY Valentine Box Ideas are your favorite? Let us know which one you will be making for Valentine’s Day! 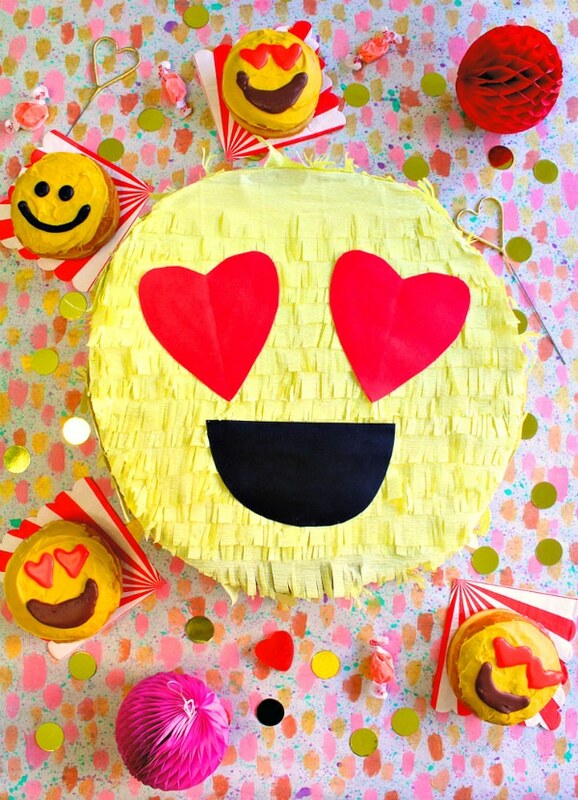 Plan a fun Valentine’s Day Party with these party products that are hand-picked by our editors! Sign up for a 30-day free trial of Amazon Prime and get free 2-day shipping on your Valentine party products just in time for the holiday! 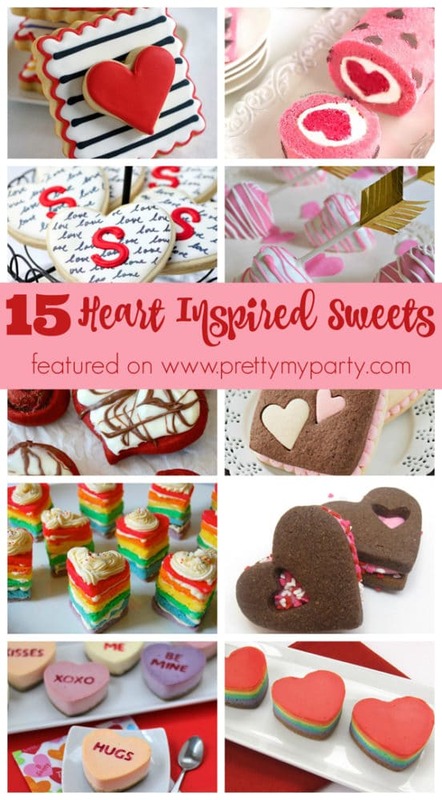 Be sure to check out these other Valentine’s Day ideas on Pretty My Party! Thanks for sharing my DIY Cardboard Mailbox, Cristy! xoxo! Anytime Cassie! Thanks for stopping by!